Las Vegas anyone? I’d imagine 134,559 Redtooth Poker members wouldn’t say no. Well that was the big prize on offer on this fabulous sunny day at Dusk Till Dawn in Nottingham, and also an indication of what Redtooth Poker has become in the five excellent years of it’s existence. Nine players would leave the building at some point in the evening of Sunday 25th March having won a prize that is every poker players dream… a week in Las Vegas with flights, accommodation and breakfast all on Redtooth! 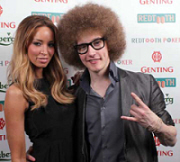 Welcome to the 2011/12 Redtooth Poker National Final. Fun Fact: Furthest player north was Craig Neate of the Argyll Hotel in Ullapool – 495 miles one way. As 9:00am passed the queue outside this prestigious venue was forming. Almost 400 players travelled from all corners of the UK to one of Europe’s largest poker venues, Dusk Till Dawn, in Nottingham with glamour model and TOWIE star, Lauren Pope and TV quiz professional Mark Labbett on hand to add some star quality to the proceedings. The players and guests were also entertained by upcoming magician Afromagic who displayed some dazzling card tricks throughout the day. Lauren Pope and Mark Labbett were also going to be present later in the evening for photos with our eventual nine Las Vegas qualifiers and to present them with their ticket and a bottle of champagne. Fun Fact: The best represented city was London with 55 players from within the M25. ‘Shuffle up n deal’ was once again announced by Tournament Director Simon Trumper as the excitement and tension was felt all across the card room. Almost exactly one minute later we had lost our first player, Paul Abbott who plays at the Hilly House in Dudley hit the rail to a huge round of applause after his K-K ran head first into A-A, which unfortunately for Paul, didn’t bring our first outdraw of the day. Paul later received a bottle of wine in a wooden box emblazoned ‘1st out of the tournament’ as a nice consolation prize, better luck next time! Fun Fact: 10% of the players at this National Final were female. Not long after the rail became much more populated which included our oldest ever regional final champion Fred Copley, aged 83, and previous West London champion Jamiee Dickinson as they both made early exits. 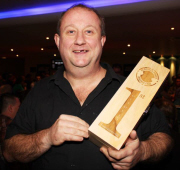 Last year’s winner, David Cheesman, who is the only UK Pub Poker Champion to re-qualify the following year made a good fist of his defence but ultimately fell short in 107th position. The previous nights RPCT winner, Carl Shipsey, carried on his good form with a top 100 finish in 81st place as the business end of the tournament was fast approaching. Fun Fact: The best represented pub was the Mulberry Tree in Warrington with four players. Once the final 20 players were reached the players’ thoughts could start turning to the prospect of a trip to Las Vegas as they were only an hour or two away after all. We still had a couple of reigning champions in the field in Richard Arnott our North Scotland champion and Nigel Hardy who is the current East Midlands champion, both held healthy chip stacks at this point. Nigel even became one of our chip leaders when his A-A found a dream scenario with another player picking up K-K, doubling Nigel up. Following a short break with only 13 players left we were soon on the bubble as Mervyn Allen, Paul Smith and Malcom Coleman left us in 13th, 12th and 11th place respectively. In what was expected to be a very long bubble it was soon burst as Craig Evans from the Winding Wheel in Cannock soon followed Malcom in 10th place as all players and rail birds crowded around the table to see the final hand of the evening. The remaining nine players all cheered and breathed a huge sigh of relief in the comfort of knowing they had made the Last Table, Las Vegas trip. All eyes are now on Sunday 13th May as the final table takes place in Las Vegas, Nevada with the new UK Pub Poker Champion being crowned later that day. Good luck guys!